Are you looking for the ultimate protection and some added style for your pickup truck? 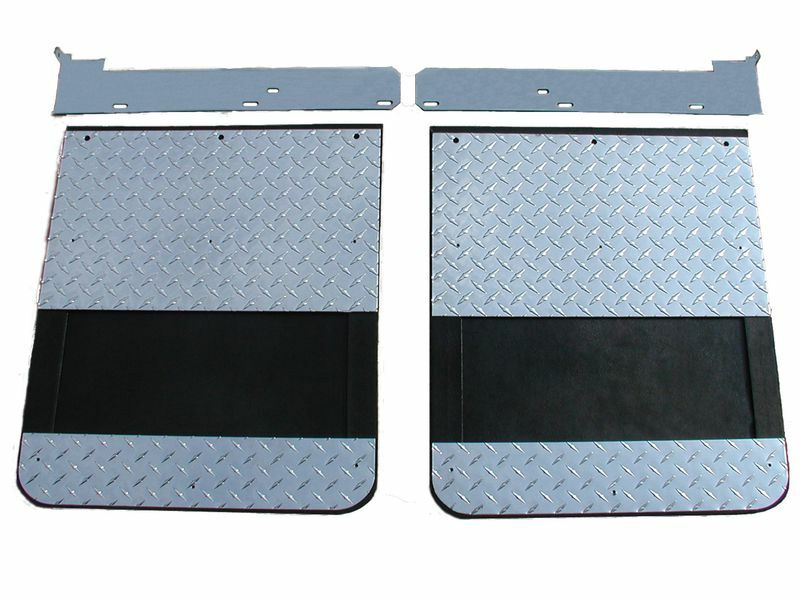 Then you need to check out the Go Industries diamond tread mud flaps. They are constructed out of rubber and include diamond plate stiffeners and weights for a great look. Go Industries diamond tread splash guards are available for dually and single rear wheel trucks. Dually mud flaps are 19 inches by 24 inches and single rear mud flaps are 12 inches by 24 inches. These mud guards can take on the abuse that the road throws at them, from rocks, muds, to other road debris. Go Industries mud flaps come as a complete rear set with mounting hardware, stiffeners, weights, and anti-sails depends on your vehicle. Some drilling may be required for installation so grab your tools and you'll have these installed in no time. What are you waiting for? Order yours now! The Go Industries diamond tread mud flaps offer an easy at home installation with drilling required on some applications. For additional information please call us at 1-877-216-5446 or 701-253-5906.